Gramophone has been the world's authority on classical music since 1923. Delivering trusted classical music reviews and intelligent, independent editorial, Gramaphone's globally acclaimed writers keep you informed and entertained in equal measure each month. 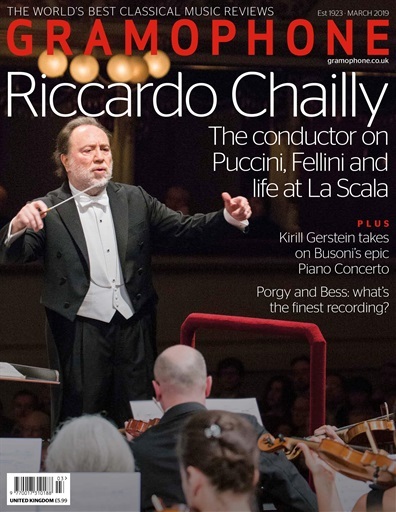 Devoted entirely to the art of classical music, each month Gramophone readers can look forward to a magazine packed with features across all classical music genres - enriching your classical music experience and connecting you with the truly great recordings from past and present. 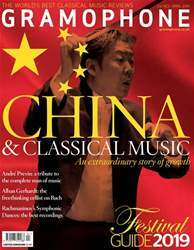 Join the many readers of Gramophone with a digital magazine subscription today - the world's leading classical music magazine. Subscribe today! 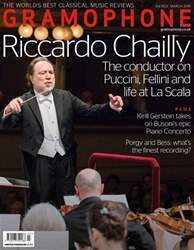 In the March issue of Gramophone, on sale from February 22, Riccardo Chailly’s 40-year relationship with Decca is being celebrated with a bumper box-set documenting his finest moments on record; Neil Fisher meets him in Milan. Meanwhile, in our two additional features, Kirill Gerstein meets with Jeremy Nicholas to discuss his new recording of Busoni’s Piano Concerto, and Gabriel Jackson tells Editor Martin Cullingford about the new Passion he has composed for the Choir of Merton College, Oxford. Elsewhere, David Gutman surveys the current recordings of Gershwin’s ‘American folk opera’, Porgy and Bess, in this month’s Collection, and Richard Whitehouse investigates the impossible-to-categorise output of Charles Wuorinen. Plus, as always, our world-leading critics review the latest classical music releases on CD, DVD and download – with the best being crowned ‘Editor’s Choice’. Originally published over 90 years ago in 1923, Gramophone magazine has been furnishing music fans with highly respected reviews and critical analysis spanning all genres of classical music ever since. Each issue contains highly recommended recordings of the month that you just can’t miss, with interesting and insightful features that explore the greater depth of the recordings and scores. 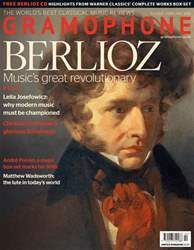 Whether it’s news, reviews, features or playlists, Gramophone magazine gives readers everything the world of classical music has to offer. As the ‘world’s leading authority on classical music’, you can expect to find all-revealing interviews with the biggest names in classical music alongside the celebration of iconic composers and musicians such as Mozart and Beethoven. With a reputation founded on acclaimed critical analyses of the latest CD releases, you can expect independent and intelligent editorial with over 150 reviews in each issue. What’s more, subscribers to Gramophone magazine will also enjoy unparalleled and comprehensive coverage of upcoming performances and live events in the UK and around the world - so you’ll know what to book! Keep yourself up-to-date on all the latest from the world of classical music with a monthly digital subscription to Gramophone magazine - download the latest magazine to your device and enjoy immediately today!